Malcolm Butler has been selected as the heir to the cornerback throne - left vacant by the recently departed Darrelle Revis. Many thought that this decision would lead to a huge drop off in production at the position and our secondary would never be the same. 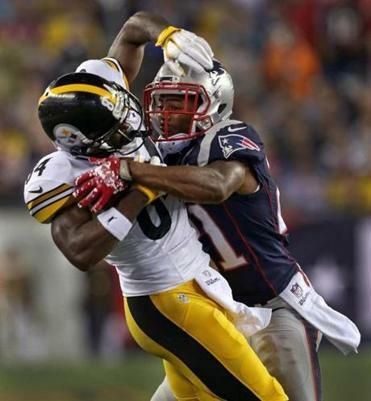 This theory was put to the test immediately in week 1 when Malcolm Butler was tasked with covering Antonio Brown, one of the NFL's premier wide receivers. Brown ended the game with 9 receptions for 133 yards and a touchdown - which would indicate that Malcolm has quite a bit of work to do. However, those stats can be broken down to a few key plays, which, if you consider the breakdowns, will actually give you faith in Butler's abilities and show that the overall numbers paint a much more negative picture than is necessary. 1 - The touchdown that Brown caught was in garbage time - in the very final moments of the game, and ultimately had no impact on the outcome - except to please fantasy owners of Antonio Brown. 2 - That catch was an incredible grab. When you watch the replay you can see that there is very little that Butler could have done to stop that - it was a perfect shot out of Butler's reach and Antonio snagged it out of the air like a true pro. 3 - There were 2 big plays that Antonio had on Malcolm - both resulting from a failure to successfully jam the receiver at the line - Antonio was able to burn Malcolm with his burst of speed and pick up 25 and 40 yards respectively. If you were to consider how difficult it is to contain a man like Antonio Brown for an entire game, how much the Steelers like to get the ball in his hands, and the fact that if you removed that touchdown and the 40 yard pass play, Brown's stats would then look like: 7 receptions for 82 yards and 0 touchdowns. That is how much difference 1 or 2 plays can make in a game. And for a new cornerback to come that close to containing arguably the best wide receiver in the league - I have high hopes for Malcolm Butler in our defense. Antonio felt the same way - commenting afterwards in an interview that Malcolm Butler has "the makings to be a great player." Here are all the Antonio Brown highlights from that game so you can see how close the coverage was on many of them. Follow me on twitter @Dexmatthews for more Patriots talk!